PASADENA, Calif. -- On a plain that stretches for miles in every direction, the panoramic camera on NASA's Mars rover Opportunity has caught a first glimpse on the horizon of the uplifted rim of the big crater that has been Opportunity's long-term destination for six months. Opportunity's twin, Spirit, also has a challenging destination, and last week switched to a different route for making progress. Endeavour Crater, 22 kilometers (14 miles) in diameter, is still 12 kilometers (7 miles) away from Opportunity as the crow flies, and at least 30 percent farther away on routes mapped for evading hazards on the plain. Opportunity has already driven about 3.2 kilometers (2 miles) since it climbed out of Victoria Crater last August after two years of studying Victoria, which is less than one-twentieth the size of Endeavour. "It's exciting to see our destination, even if we can't be certain whether we'll ever get all the way there," said John Callas of NASA's Jet Propulsion Laboratory, Pasadena, Calif., project manager for the twin Mars rovers, Opportunity and Spirit. "At the pace we've made since leaving Victoria, the rest of the trek will take more than a Martian year." A Martian year lasts about 23 months. 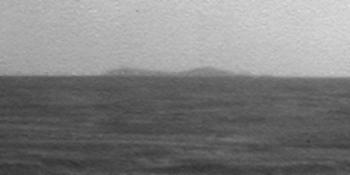 The image with portions of Endeavour's rim faintly visible can be seen online at http://marsrovers.jpl.nasa.gov/gallery/press/opportunity/20090318a.html. v Steve Squyres of Cornell University, Ithaca, N.Y., principal investigator for the rovers' science instruments, said, "We can now see our landfall on the horizon. It's far away, but we can anticipate seeing it gradually look larger and larger as we get closer to Endeavour. We had a similar experience during the early months of the mission watching the Columbia Hills get bigger in the images from Spirit as Spirit drove toward them." Both rovers landed on Mars in January 2004 to begin missions designed to last for three months. Both are still active after more than five years. For the next several days, the rover team plans to have Opportunity use the tools on its robotic arm to examine soil and rock at an outcrop along the route the rover is taking toward Endeavour. "We're stopping to taste the terrain at intervals along our route so that we can watch for trends in the composition of the soil and bedrock," Squyres said. "It's part of systematic exploration." The pause for using the tools on the arm also provides two other benefits. Opportunity's right-front wheel has been drawing more electric current than usual, an indication of friction within the wheel. Resting the wheel for a few days is one strategy that has in the past helped reduce the amount of current drawn by the motor. Also, on March 7, the rover did not complete the backwards-driving portion of its commanded drive due to unanticipated interaction between the day's driving commands and onboard testing of capabilities for a future drive. The team is analyzing that interaction before it will resume use of Opportunity's autonomous-driving capabilities. Meanwhile, on March 10, the rover team decided to end efforts to drive Spirit around the northeastern corner of a low plateau called "Home Plate" in the inner basin of the Columbia Hills, on the other side of Mars from Opportunity. Spirit has had the use of only five wheels since its right-front wheel stopped working in 2006. Consequently, it usually drives backwards, dragging that wheel, so it can no longer climb steep slopes. Callas said, "After several attempts to drive up-slope in loose material to get around the northeast corner of Home Plate, the team judged that route to be impassable." The new route to get toward science targets south of Home Plate is to go around the west side of the plateau. Squyres said, "The western route is by no means a slam dunk. It is unexplored territory. There are no rover tracks on that side of Home Plate like there are on the eastern side. But that also makes it an appealing place to explore. Every time we've gone someplace new with Spirit since we got into the hills, we've found surprises." JPL, a division of the California Institute of Technology, Pasadena, manages the Mars Exploration Rovers for the NASA Science Mission Directorate, Washington. More information about the rovers is at http://marsrovers.jpl.nasa.gov/home/index.html .